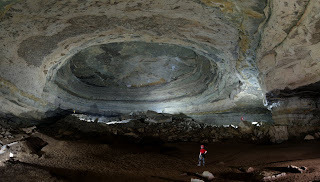 Karst Worlds: Cave City: Huntsville is rich in caves, with at least 240 cataloged and exploredHUNTSVILLE, AL. Cave City: Huntsville is rich in caves, with at least 240 cataloged and exploredHUNTSVILLE, AL. An estimated 240 caves are known, named and catalogued by the Alabama Cave Survey within the city limits and Redstone Arsenal, according to the 2005 publication “Tales of Huntsville Caves.” Between Madison and Jackson counties, there are more than 2,000 mapped caves. “Half of the known caves in the state of Alabama are in these two counties,” said Michelle Vaughn, a caver since age 10 who serves as Huntsville Grotto’s treasurer and works for the National Speleological Society. But, that estimate can vary since new caves are being discovered while older caves are being destroyed. You don’t have to search far to find a cave in Huntsville. Just ask 67-year-old Bill Torode, an active caver and surveyor who has mapped more than 1,000 caves. Sometimes a property owner will inform either the National Speleological Society - it happens rarely - or a caver like Torode about a possible cave on the land. Other times, you just simply look for holes in the ground. Word is that whoever finds the cave has the rare opportunity to name it. “I was walking through the woods back to my car one time, just looking for holes in the ground,” said Torode, who has named hundreds of caves. “I come across a blue balloon sitting in the woods that must have floated from somewhere. “Right by the balloon was an opening to a cave, so I named it Blue Balloon Cave,” said Torode with a shoulder shrug. Next time you step into the Madison County Courthouse in downtown Huntsville, remember this: You are standing above a cave. Big Spring Cave was first recorded in 1916 when the city inspected the geological site. In “Tales of Huntsville,” the spring was still the municipal water supply - vital to the area since John Hunt’s discovery in the early 1800s. On Oct. 6, 1939, Dr. Walter B. Jones and his brother Carl T. Jones visited the cave to enroll it as No. 57 in the Catalogue of Alabama Caves and Caverns. Officials even considered Big Spring Cave to serve as a nuclear fallout shelter during the Cuban Missile Crisis in 1962. In 1964, when the new courthouse was to be built, careful planning was considered in regard to the grotto’s current map of Big Spring Cave. A new survey revealed another cave under the northwest corner of Jefferson Street and Northside Square. “When they were building the courthouse, they did a number of borings (drillings) and investigated the cave,” said Ben Ferrill, a geologist and environmental planner with the city of Huntsville. “If you look at the courthouse now where it stands on the square, the main structure is not centered. To support the courthouse and prevent the collapse of the cave roof, concrete pillars were installed inside the cave for support. “Tales of Huntsville” notes the northern part of the courthouse is not as high as the southern part of the building. This was done to reduce the weight on the thin section of the cave’s ceiling. Both natural entrances - the entrance by the actual spring and the entrance above the spring between the Bank Building and Cotton Row - are closed. To enter Big Spring Cave nowadays, the gateway is a manhole in the middle of Green Street.